Blackheads are a form of acne recognized by the open black blemish they leave, report doctors at the Mayo Clinic. Also called comedones, blackheads are formed by oil, dead skin cells, bacteria and dirt that get clogged in a hair follicle. While there are a number of home remedies for blackheads, there are medical treatments available when the blemishes do not respond to home care. Medical treatment also can help to avoid permanent scarring. A dermatologist may prescribe a cream or ointment that is stronger than the typical over-the-counter acne creams for persistent blackheads. Most prescription creams are made from vitamin A derivatives, such as adapalene, tazarotene and tretinoin. Topical antibiotics also can help to kill the bacterium that becomes trapped in the blackheads. Combined with benzoyl peroxide, antibiotic creams can promote new cell growth and destroy the bacteria. Side effects are common with topical prescription creams and usually include stinging, redness and burning. Often stronger internal antibiotics are required to destroy the blackhead bacteria. Antibiotics also can help to reduce inflammation that often occurs with blackheads so that the topical creams can work better. Antibiotics can cause upset stomach and make the skin more sensitive to the sun. Patients also can build up an antibiotic resistance, so usage should be limited. Many women use oral contraceptives to control blackhead outbreaks. Birth control pills that contain norgestimate and ethinyl estradiol can be effective treatments although they also carry side effects that may include headaches, depression, nausea and an increased risk for breast cancer. Light and laser therapies can target the deep roots of the blackheads without causing additional skin disfigurements. Laser treatment targets the deep pockets of oil that cause blackheads and reduces the future supply of oil. Beams of light from light therapy tools attack the underlying bacteria in the blackheads. Laser and light therapies often are considered cosmetic treatments and may not be covered by all insurance policies. Most patients only experience a slight redness that quickly dissipates within a day or two following the procedure. 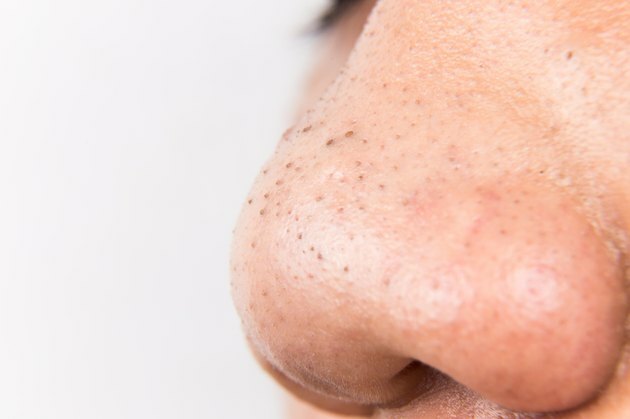 Doctors at the American Academy of Dermatologists strongly discourage patients from squeezing blackheads to remove them. Rather, dermatologists prefer to extract the blackheads under sterile conditions in the medical office by using a pen-sized device that squeezes the oil and bacteria out of the hair follicle. Some extractions require the use of a thin blade to cut out the blackhead. There usually is a small scar left from an extraction that should heal if the extraction was performed properly.